What are the best things to do in Norcia? Come and discover it with our mini-guide! The birthplace of St. Benedict, the homeland of the famous Black Truffle and norcini butchers, will captivate you in a unique and unforgettable experience of colors, scents and flavors! Sort close to the Sibillini Mountains and considered the center of the most charming of the Nera Valley, Norcia offers wonderful scenery of nature! 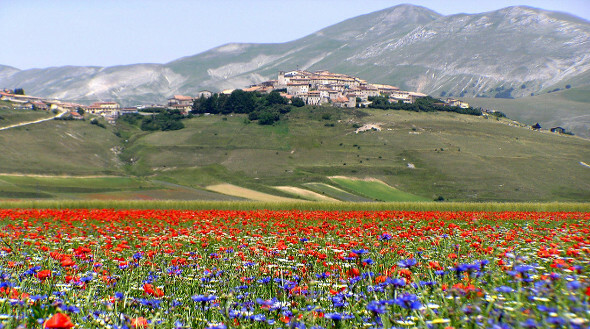 Especially during the period of flowering, when the plateau of Castelluccio shows its best natural spectacle, many visitors come to Norcia to see the carpet of colors and scents that lies in front of their eyes! Other scents that you will not forget are the ones gastronomy, from the nose to the butchery! 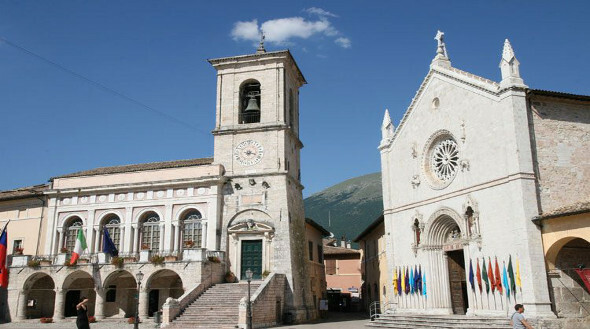 >> Do you want to visit Norcia? Check it out now of the best hotels in Norcia, Italy. Things to do in Norcia just arrived? Once in the main square you can visit the Church of St. Benedetto, built over the birthplace of the saint. Built on the basis of a Latin cross and nave, the original church in 1200 is on two floors: the lower the crypt where you can see the remains of Roman walls and the top of the main church. Outside the main entrance and turning to the left, under a porch in 1500 will align the ancient "Measures" (XIV c.), Large vessels of stone, used in markets as a unit of measurement for the goods. Staying in the square you can see the Town Hall of the thirteenth century, Loggia, Staircase and Bell Tower. Inside you can visit the Hall of the Great Council, the Sala Sertoriana or Quaranta conservatori della pace and the Cappella dei Priori, which contains the precious reliquary of St. Benedict, one of the last in the Gothic style. Fortified residence apostolic seat of the governors , the Castellina was built by the Pope Julius III to ensure the Papal more control over the town of Norcia. Restored in the eighteenth after several earthquakes, it became the seat of the government offices of the City, only to be destined to the preparation of the Civic and Diocesan Museum. When you have finished the tour of the churches, what other things can you do? Other things to do in Norcia is the visit to Marcite, an irrigation systems created by Benedictine monks between the '400 and '500 which allowed flood large areas of land in a continuous and controlled for long periods of the year, allowing the collection of an abundant hay. 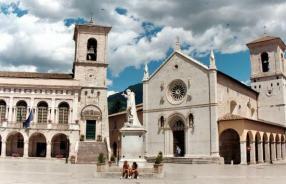 After the cultural tour of the churches, what are the best Things To Do In Norcia? You can take a relaxing nature walk in the direction of Castelluccio di Norcia, a small windswept village, built on a hill in the heart of the Monti Sibillini. A lot of alternatives are offered to the most adventurous tourist: trekking, horseback riding, rafting, canoeing, mountain biking.. At a height of 1542 meters the mountain area of Forca Canapine is the ideal place for alpine skiing and home of the best free flight school in Europe. At the beginning of summer, usually between the second half of June and early July, you can admire the famous fioritura of the plain, a natural spectacle that attracts hundreds of tourists from all over the world. In the area of Norcia you can taste many typical and genuine products: there is something for everyone! Starting with the delicious dishes cooked with black truffles and continuing with goat cheese, barley, saffron, Castelluccio lentils and mushrooms, especially porcini. In the woods you can also collect a large amount of berries. Here was born the art of norcino-butcher, a real specialization in the processing of pork meat. 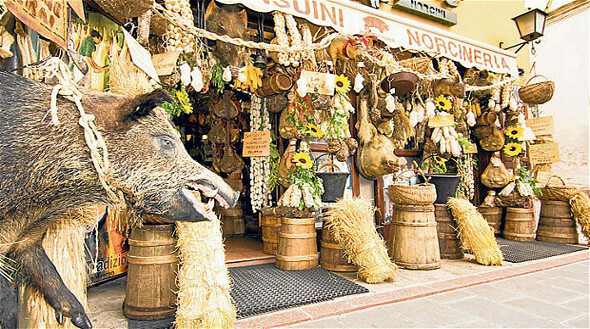 In the many norcinerie you can taste and buy the prosciutto di Norcia IGP and a lot of different kind of sausages. View the best restaurants in the area of Norcia! >> Click here and book. Other things to eat in Norcia? For seafood lovers suggest you try the trout of the Nera river and crayfish. And finally you have to taste a glass of beer produced by Benedictine monks! >> If you've decided to see Norcia and enjoy the local culinary specialties based on truffle, you should contact now farm houses in its vicinity >> click this link.